Born in Vancouver, I am a B.C. girl at heart. As a child I lived in Kitimat. My father taught at Kildala Elementary School. Our family eventually moved to Kamloops where I finished high school at Westsyde Secondary (a proud Westsyde Whunda!). After a few years at community college and U.B.C., I went back east for a B.Sc. from McGill University. My major was Nutrition. I also have a Masters of Science from l'Université of Montréal. During the 1990s, I worked for the United Nations Children's Fund (UNICEF) on programs for maternal and infant nutrition in Guatemala (1990-1995) and Indonesia (1996-2000). I also did some food aid planning for the U.N. High Commission for Refugees (UNHCR). Before that, I had worked with Algonquin people to prevent diabetes in their communities in the north part of Quebec. During 2002 and 2003, I was Corporate Development Manager for North America for NUTRECO, one of the world's largest producers of farmed salmon and fish feed. In 2006, I prepared a submission to the Special Committee on Sustainable Aquaculture of the B.C. Government. While preparing that submission, I unexpectedly came across a grant for an "antifarming camapign" with "science messages" and "earned media." When I raised questions about this grant from the Gordon & Betty Moore Foundation, four grants for a multi-million dollar campaign against salmon farming were quietly re-written by the Moore foundation. 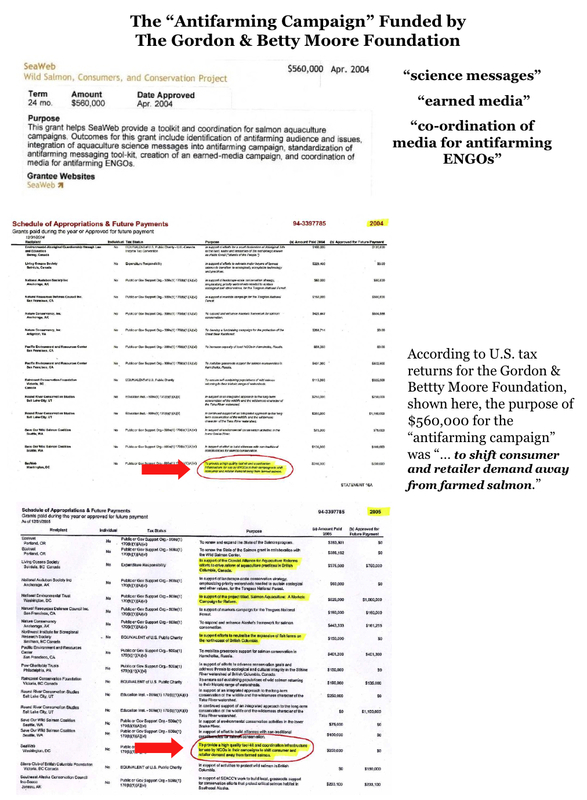 While going through the tax returns of American charitable foundations to try and figure out who was funding the campaign against salmon farming, I happened to notice many grants for a "Tar Sands Campaign" (see here also). That's when I started to write about the campaign against Alberta oil. If you would like to read more about how I ended up going from UNICEF to salmon farming, and started writing this blog, please click here. Since the fall of 2010, I have been writing a series of articles published in The Financial Post. I reside in North Vancouver and can be reached at vivian.krause@mac.com or @FairQuestions, on Twitter. For details about the presentations that I have given and the honorariums, if any, that I have received, please click here. See also: Disclosure: Who Funds Vivian Krause?